The mere sight of Finland international Joel Pohjanpalo's name on the Bayer 04 Leverkusen teamsheet is sure to send shivers down the collective spine of PFC CSKA Moskva in Wednesday's UEFA Champions League Group E encounter at the BayArena (kick-off: 20:45CEST/18:45GMT). Pohjanpalo's Official Fantasy Bundesliga stock is rising fast - sign him up now! The 22-year-old striker has been one of the standout performers of the new Bundesliga season and currently finds himself sitting joint-top of the scoring charts alongside FC Bayern München counterpart Robert Lewandowski on four goals from two games - despite being Bayer's fourth-choice forward and only featuring as a substitute. 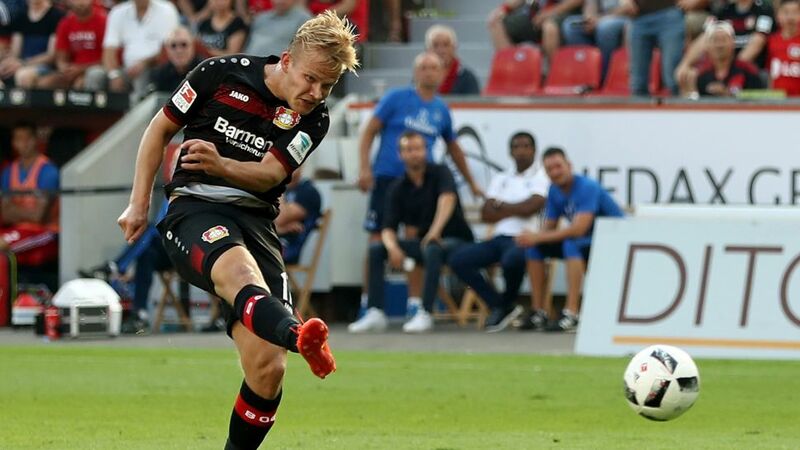 "Hearing the fans shouting your name - there's nothing better in football than that," Pohjanpalo admitted after stepping off the bench to fire Leverkusen to a 3-1 win against Hamburger SV with a stunning 11-minute hat-trick at the weekend. "It's the best moment in my professional career. It was a great feeling." Pohjanpalo's emergence as an early front-runner for the Tojägerkanone ranks up there with RB Leipzig's maiden Bundesliga win as the talking point of the still-young Bundesliga campaign. He has resurrected a career that had flatlined on the back of a forgettable two-season loan spell in the second tier with Fortuna Düsseldorf, and is now in line to be unleashed on Europe's elite in the Champions League for the first time. "Everyone knows what happened at Fortuna," he recalled. "It wasn't easy for me. It's a shame, but things sometimes happen like that. I always knew I was good enough to play [for Leverkusen]. I'm still last in the pecking order behind Javier Hernandez, Kevin Volland, Stefan Kießling and Hakan Calhanoglu, though." For Leverkusen's Champions League Group E competitors CSKA, AS Monaco and Tottenham Hotspur FC, it is a frightening proposition. Even with the most experienced and most prolific member of Leverkusen's new-fangled attack, Kießling, currently sidelined through injury, Bayer head coach Roger Schmidt still has a plethora of options at his disposal to fuel the Rhineland club's hunger to go deep into the knockout rounds of the competition. "We're much stronger than last season," explained Leverkusen's Olympic silver medal winner Julian Brandt. "Joel [Pohjanpalo] has come in and he's a great fit. He's straight-forward and doesn't hang about. He's actually a quiet guy, but on the pitch it's completely different. He runs, slogs away, works and has a lot of efforts on goal. He brings a lot of things to the table that we don't have in the team. We've got no reason to hide from anyone."